I rarely watch Rachel Ray, but had the TV on when I was baking Christmas cookies. 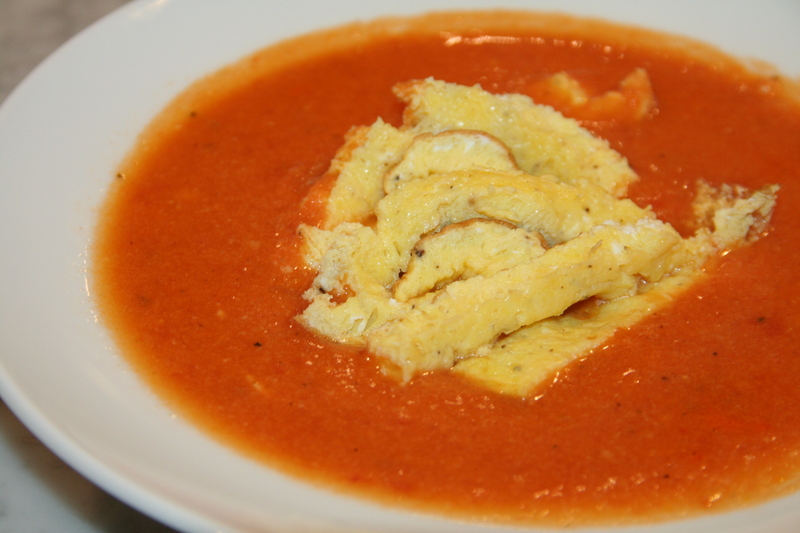 This recipe sounded different, and I knew that my son would love it– it combines two of his favorite things: tomato soup and eggs. I used my homemade turkey stock and doubled the soup recipe. I try to keep soup in the freezer for last minute meals. It was good. For the soup, heat the olive oil, 2 turns of the pan, in a large soup pot over medium to medium-high heat. Add onions, garlic, carrot, salt, pepper, thyme, bay and cook partially covered to soften 10-15 minutes, stirring occasionally. Add tomato paste and stir 2 minutes; add stock, tomatoes and basil. Simmer partially covered for 30 minutes, remove and discard bay leaf. Purée soup in a blender and return to pot. To make the béchamel sauce, melt butter in a saucepot over medium heat, whisk in flour and cook 1 minute. Whisk in milk, season with salt and pepper, and let thicken to coat a spoon. Stir béchamel into soup to combine. For the “noodles,” beat eggs with cheese, salt, pepper and parsley. Melt butter in a 12-inch skillet over medium heat and add half of the egg mixture. Swirl into a very thin, large layer, cover with loose foil and cook to completely set, 3-4 minutes. Repeat with remaining egg mixture. Remove pan from heat and roll up eggs into 2 logs. Slice each log into 1/4-inch “noodles”. Serve soup in shallow bowls topped with a few “egg noodles”. I live in Stony Brook, New York on Long Island. I love garlic and baking. My hobby (and love) is to try new recipes. My favorite recipe resources include The New York Times, Food and Wine, Bon Appetit, and Martha Stewart Living. Enjoy!